Clethra 'Crystalina' is the first dwarf Clethra that has been introduced. The plant habit is rounded to slightly spreading and it matures at just about 1 meter tall, making it a great selection for smaller spaces. It produces lovely fragrant white flowers in late summer on this year's growth. The flowers persist for 4-6 weeks then give way to attractive long lasting seed heads. 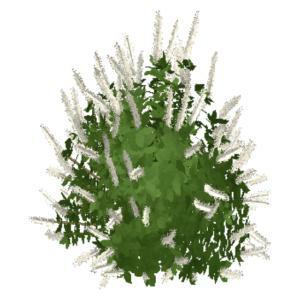 It is unique among flowering shrubs because it will bloom in more shaded locations and does so in late summer when few other plants are blooming. It can be massed or grouped in borders or used in woodland gardens. 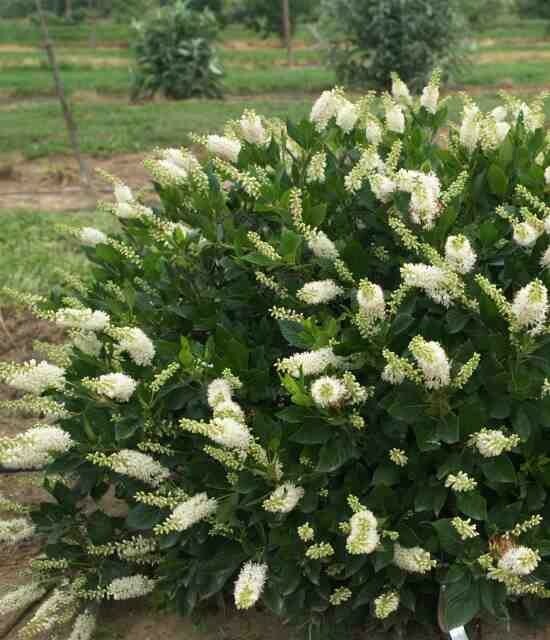 It is an ideal flowering shrubs for smaller gardens and foundation plantings. Clethra 'Crystalina' is a very compact form of Summersweet which holds its tight dense shape so little pruning is needed. It prefers a lightly shaded location and moist soil that is acidic so peat moss should be incorporated into the soil at planting time. Water it during periods of drought to prevent leaf scorch.